People with dark hair can add red highlights for a change. Highlighting hair can change your overall look, and people with every hair type or color can add highlights of different shades. Individuals wishing to add red highlights to dark hair should look for red colors that are between two and five shades lighter than their base color. Highlighting kits are available at most grocery stores, drug stores or beauty-supply stores. Pick a highlighting color based on the desired overall effect. For a more natural look, choose a red highlighting shade that is two to three shades lighter than your natural color. For a more dramatic look, choose red shades that are between four and five shades lighter. Do a color test on a strand of hair that is not easily visible at least one day before highlighting the rest of the hair. 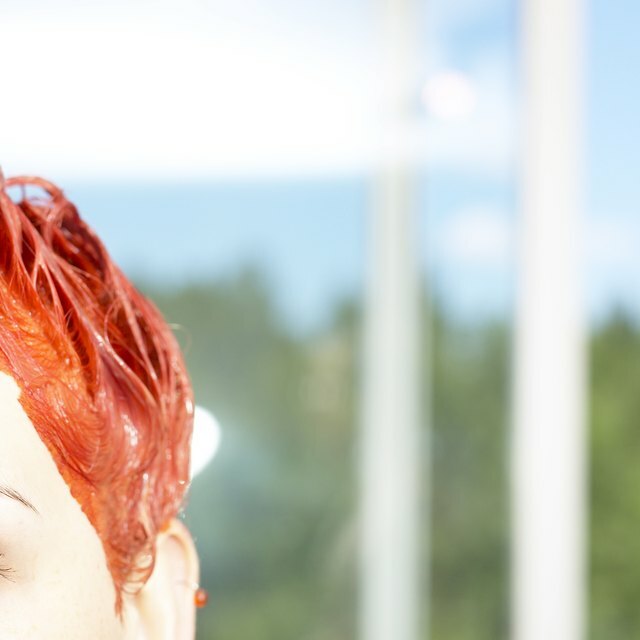 This is done to check for any allergic reactions to the hair color. Refrain from washing hair a day or two before highlighting because dry, unclean hair will absorb color best. When ready to highlight hair, put on old clothes and cover your work surface with an old towel. Put petroleum jelly along your entire hairline, including on the top of the ears and back of the neck. Combine the coloring cream and the highlighting color into a plastic bowl. Create small-to-medium sized sections of hair on the top of the head. Smaller sections will create a more delicate look, while larger sections will be more noticeable. Apply the highlighting mixture to each section and make sure the hair is thoroughly and evenly covered. Use a small comb to comb through each section after you have applied the highlighting mixture. Work your way around the head until you have highlighted all the sections you want colored. Allow the highlights to set for 10 to 30 minutes. Rinse with warm water and follow with a gentle shampoo and a deep conditioner.